With server restart 02:00 UTC on September 25th new maps will be added to Matchmaking, a new skin “Ricochet XT” will be released, and turret balance for Ricochet, Magnum and Striker will be updated. Cologne — slightly increased in length with the team bases, to make team play more comfortable in 8v8. Parma — the upper platforms were increased, which makes it possible for several tanks to maneuver in the area at the same time. Magistral — small visual changes. Bobruisk — increased some areas, additional space added on team bases. New versions of the maps will also be added to PRO-battles. New skin didn’t take long to arrive, let’s welcome the continuation of the XT-series — Ricochet XT! After server restart September 25th this skin will be added for purchase in the Shop, and it will also be added to containers. At the same time the previous special offer with Freeze XT will be removed from the Shop. If you didn’t purchase the offer yet — there’s still time! 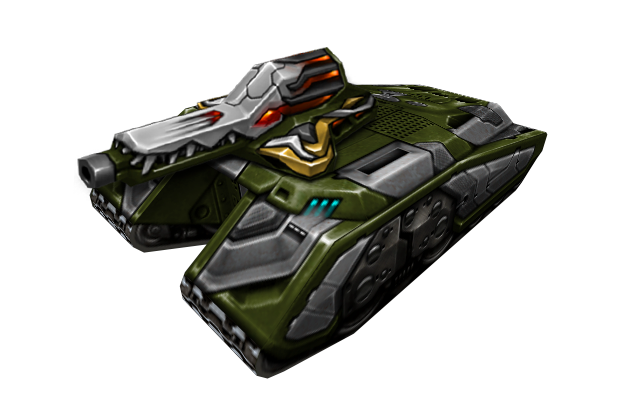 Ricochet XT is styled after crocodile’s maw. Sharp hard teeth will make your enemies think many time over, before attacking. Can’t wait to check the skin out? Then uncover the terror below! The charging speed and the energy capacity used up with every shot were decreased. This means, that the energy used for the shot will be replenished slower, but there will be more shots per each energy tank. Also, the maximum shot distance was decreased, to not make the turret overpowered at longer ranges. We remind you, that Ricochet is supposed to be short range. The reload speed after the shot and the time of charging the power of the shot are now tied* to each other. If you’re firing without a full charge up, then the time you would use to charge the shot to 100% will added to the reload time. This change is designed to make the turret less effective at close range. In addition to the change, splash damage parameters are changed in such a way, that hitting a tank with splash damage won’t be as effective as a direct hit. Aim! Splash damage effectiveness was increased — when the rocket blows up near the tank it will now deal more damage. The length of Matchmaking battles was reduced to 9 minutes. Increased the number of MicroUpgrade steps for M0 hulls and turrets to 20. The overall price and time of upgrading equipment will remain the same. Example: final cost for starting all Wasp M0 MicroUpgrades (without SpeedUps) is 26,300 crystals. After the update the number of steps will be increased 2 times, but each upgrade step will cost less, and the final cost will stay 26,300 crystals. The same applies to SpeedUp costs and wait time. The full list of changes will be posted in Patch Notes. Launch the game on September 25th and share your impressions about the update here!